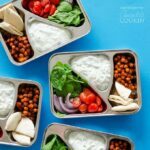 Chickpea Gyro Lunch Boxes: a 30 minute meal prep for the whole week! 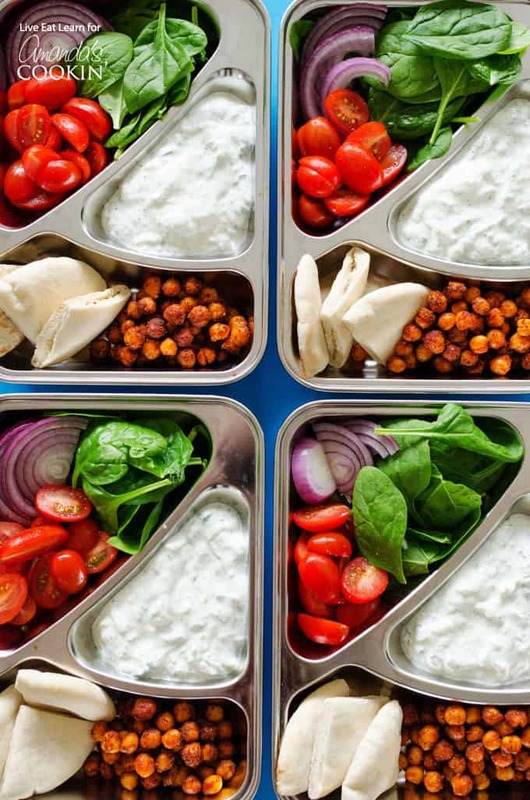 Ditch the boring sandwiches and make yourself something seriously delicious for lunch with these Chickpea Gyro Lunch Boxes! In under 30 minutes, you’ll have lunch ready for the week. Don’t forget to check out our recent post on Mix and Match Meal Prep as well! I’ve been in love with gyros for a loooong time. Back when I lived in Alaska and trips to “the city” involved going to the shopping mall then ducking into the small Greek takeout shack next door to grab some gyros. And then I moved to Europe and learned about the late night food magnificence that is the doner kebab (a similar dish to gyros), and my love grew more. But then I decided to eat more vegetarian and was suddenly left with a gaping hole where gyros used to be. So I created Roasted Chickpea Gyros. These chickpea gyros quickly became THE most sought-after recipe on Live Eat Learn. They balance spicy seasoning with refreshing tzatziki and are SO filling. But there was just one problem with them. You can’t take them for lunch very easily (which of course, you will want to, they’re THAT good). So today we’re transforming this popular wrap recipe into a meal-prep-able, travel-friendly form! If making the original wrap recipe was easy, then this is seriously a walk in the park. You’re just going to get yourself a can of chickpeas, drain, and pat them dry. Season with the good stuff (smoked paprika, cayenne, salt, the usual), then bake until crispy. While that’s going, whip up your tzatziki, a simple combo of yogurt, garlic, cucumber, and lemon. Pack into boxes with sliced up pita bread, lettuce, tomato, and onions and you have yourself a week’s worth of tasty lunches waiting for you! 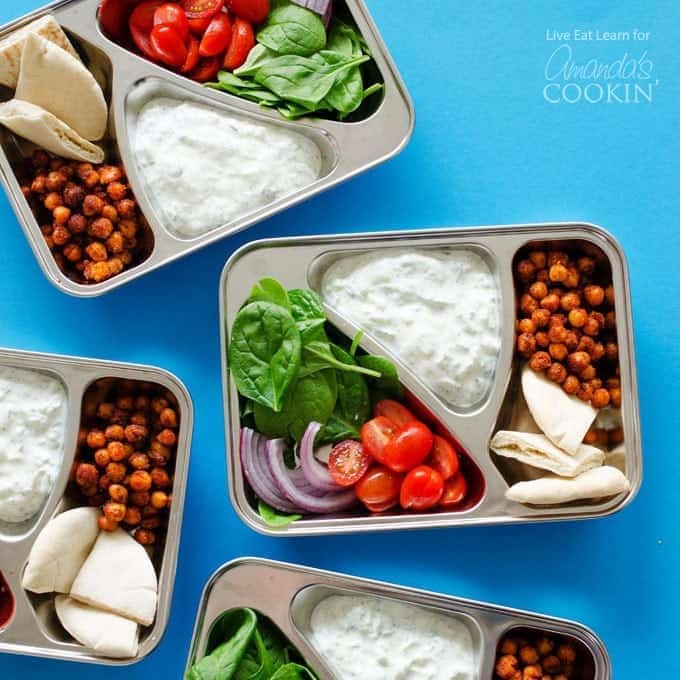 These chickpea gyro lunch boxes are an easy and tasty lunch to keep you energized throughout the week. For another fulfilling lunch recipe, try this Toasted Ham, Cheddar, and Arugula Sandwich for your next meal or swap out a few things in your lunch box for homemade Baba Ganoush Hummus with some veggie slices! This ultra-comforting sandwich is not only a classic but a favorite! 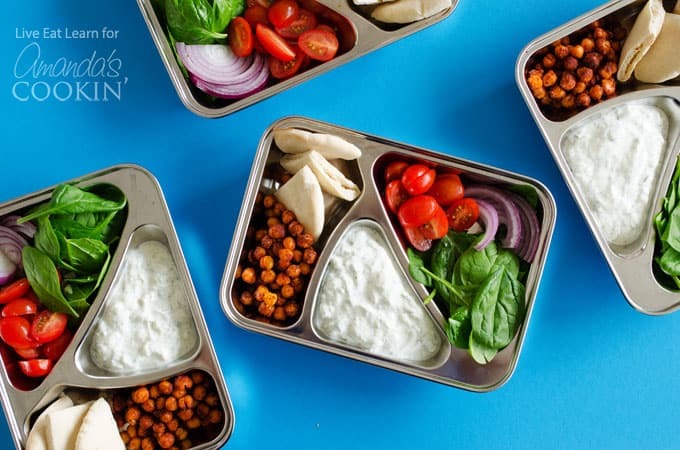 Ditch the boring sandwiches and make yourself something seriously delicious for lunch with these Chickpea Gyro Lunch Boxes! In under 30 minutes you’ll have lunch ready for the week. Pat dry chickpeas with paper towel, removing any skins that may come off. 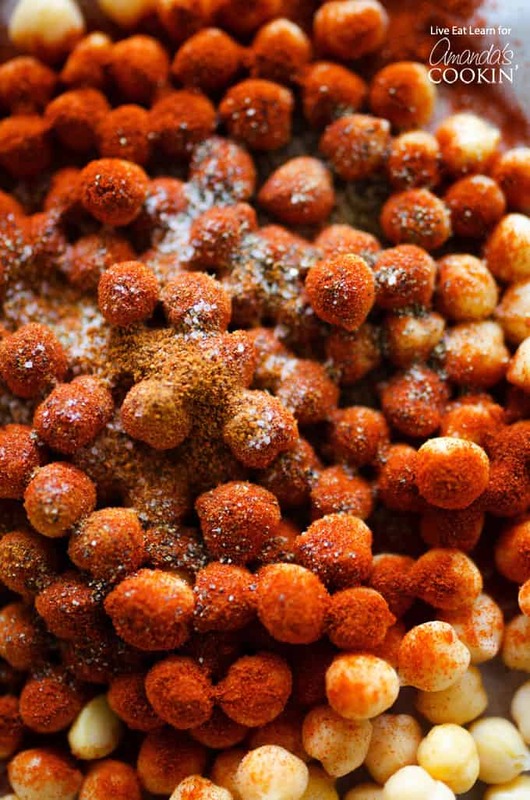 Gently toss chickpeas with oil, paprika, black pepper, cayenne pepper, and salt. Spread onto a greased rimmed baking sheet and roast at 400 degrees F (200 C) for about 20 minutes, until lightly browned but not hard. To assemble, spoon chickpeas evenly into 4 or 5 lunch boxes. 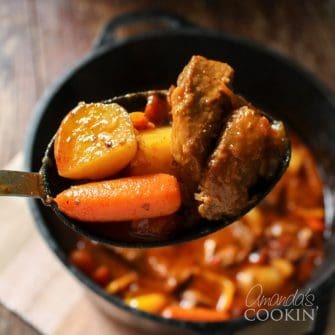 Add in pita bread wedges, veggies, and sauce (if your boxes do not have separate compartments, store the sauce in a separate container to keep the chickpeas and spinach crisp. Sarah is the publisher behind the vegetarian health food blog, Live Eat Learn. An Alaskan self-taught cook and nutritionist by trade, she loves all things food and health. When she's not exploring new ways to cook up healthy ingredients, she's romping around the Netherlands, her new stomping grounds!